Hedgehogs have just become legal to own here in Arizona. My youngest has wanted a hedgehog ever since she saw one in New Mexico when she was like 3 years old (she’s currently 14). We thought it would be great if we got her one for Christmas but since they just became legal, the chances of finding a reputable legit breeder here in Phoenix was nill. We found one in Albuquerque but had no way to get it. My father-in-law just so happened to be passing through Flagstaff on his way to California Sunday and said he would pick said hedgehog up and meet us in Flag. So we packed the whole family up in the car and headed North under the pretense that we were just going up to see the snow. She had no idea until we met my father-in-law in the parking lot of a Shell station with one road worthy hedgehog why we were going there. Mission successful! Six hours in a car, four-hour round trip and a world wind tour of Flagstaff to see the look on my daughter’s face… Totally worth it. All this to say, today’s strip did not get finished last night. I will finish and post it on Tuesday. Make sure you check in tomorrow. The bad news, we can’t own a chimp anymore. Sorry Bubbles. We’ll return to our regularly scheduled strip after this brief “daddy loves his daughter” break. Yeah. Can’t imagine anyone giving me a hard time about not doing a strip after that story. That is a good story, Hedgehog’s make it worth the wait. Way to go, Ray! Have a wonderful visit in CA. It was sooo great of him to do that for us. We literally saw him for 5 minutes and we parted ways. Hey Sandy hi! Almost mDe me want one…almost. 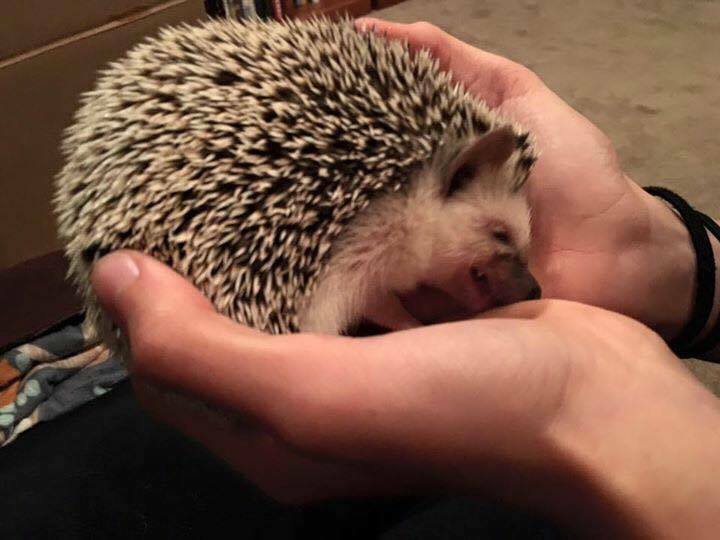 A friend of mine had a hedgehog. They are pretty neat little critters. Pretty docile from what I’ve seen. The pic doesn’t do it justice. It looks like it’s gnawing my kids hand off, but it’s actually licking it. That’s a wonderful reason to be a day late. Hope you all have a great Christmas!! !